Kefalonia has some of Europe's Hottest Beaches as listed by the Travel Channel: Biarritz, France, Ibiza, Spain, Tarifa, Spain, Cannes, France, St. Tropez, France, Brighton, England, Kefalonia, Greece, Marbella, Spain and Cadiz, Spain. 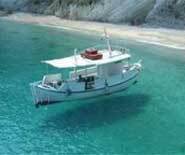 The largest of the Ionian Islands (area: 781 sq. Km., coastline: 254 Km. ), it is stunningly scenic. 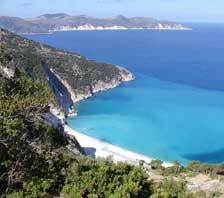 After Lesvos in the northeast Aegean, Kefalonia enjoys the sunniest days in all of Greece. For those who haven’t visited the country before and want a taste of untamed Greece, Kefalonia is probably the best bet. The good road network, which covers the whole island, makes it easy to explore Kefalonia from one side to the other; its deep blue waters, steep bare cliffs, lush valleys, picturesque, secluded villages. The tourist structure is such that it doesn’t infringe on the natural beauty, which means you can enjoy all the creature comforts of home whilst soaking up the luxuries of a sun-drenched paradise in near if not total seclusion. Kefalonia features numerous impressive landscapes, interspersed with important churches and monasteries to such an extent that specialists have called the island "a vast ecclesiastic museum". Landscapes vary from soaring mountains to pine forests, fertile valleys and beaches. Many of the island’s beaches are of fine golden sand, which shelves gently under sparkling water - ideal for children. Other beaches on the island are of white, red and grey sand and sparkling white pebbles. For the explorer, Kefalonia offers many ancient sites of unrivalled beauty: Venetian fortresses and monasteries; Byzantine churches containing icons; underground Mycenaean tombs dating back to 1200 BC; serene lakes surrounded by cypress trees; large caves encrusted with stalactites; and a host of small fishing villages and secluded coves. In every part of the island you'll run into groves filled with olive or orange trees and hillsides studded with grapevines; breathtaking beaches and deep coves, rugged rocky shores or visit famous caves. Mount Ainos, in the centre of the island, looks down through thick pine forests to a luxuriant landscape of lemon, grape, wheat and wild lavender fields. The many tavernas on the island serve an extensive range of delicious dishes exclusive to the island. "The half-forgotten island of Cephalonia rises improvidently and inadvisedly from the Ionian Sea; it is an island so immense in antiquity that the very rocks themselves exhale nostalgia and the red earth lies stupefied not only by the sun, but by the impossible weight of memory. The ships of Odysseus were built of Cephalonian pine, his bodyguards were Cephalonian giants, and many maintain that his palace was not in Ithaca but in Cephalonia." This description of the beautiful Greek island of Kefalonia is taken from the opening pages of Louis de Bernieres' best-selling novel, "Captain Corelli's Mandolin". The book was the subject of a film starring Nicholas Cage and Penelope Cruz, which was filmed on Kefalonia around the town of Sami in 2002. Ithaca is separated from Kefalonia by a channel some 2 to 4 Km wide. The west coast of the island is steep and almost barren in contrast to the green, gentle shoreline on the east. Throughout the ages Ithaca (area: 96 sq. Km. ; coastline: 101 Km.) has been known as the home of Odysseus. For years Homer’s hero wandered before he finally returned to his island kingdom. Though he visited beautiful, exotic, far-flung lands, Ithaca never left his mind for a moment. And even today, once you’ve been to Ithaca, it’s difficult to forget this small, mountainous island with its captivating coves that conjure up some earthly paradise.